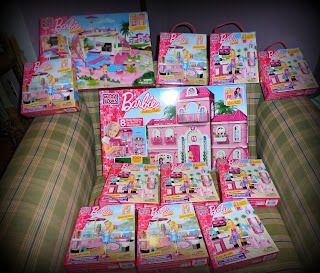 Imagine the excitement when MomSelect and Mega Bloks sent us a big box full of the Mega Bloks Barbie building sets to get our Mommy Party on. Not only was 7yo Katie as excited as Christmas morning, but all of our friends got excited for our party, too - because, I'll be honest, we are a fun family. Um, or maybe because we were going to get a chance to play with the Mega Bloks Barbie Build 'N Style Luxury Mansion and Pool Party plus some cool accessories. 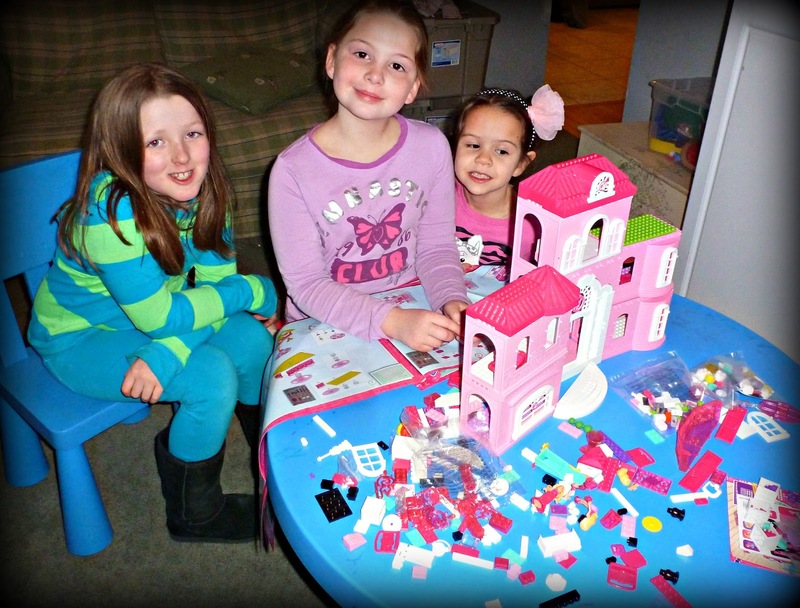 Bright colors, Mega Bloks, girls, Barbie themed: Excitement! I was thrilled for the opportunity to watch Katie play with these sets. 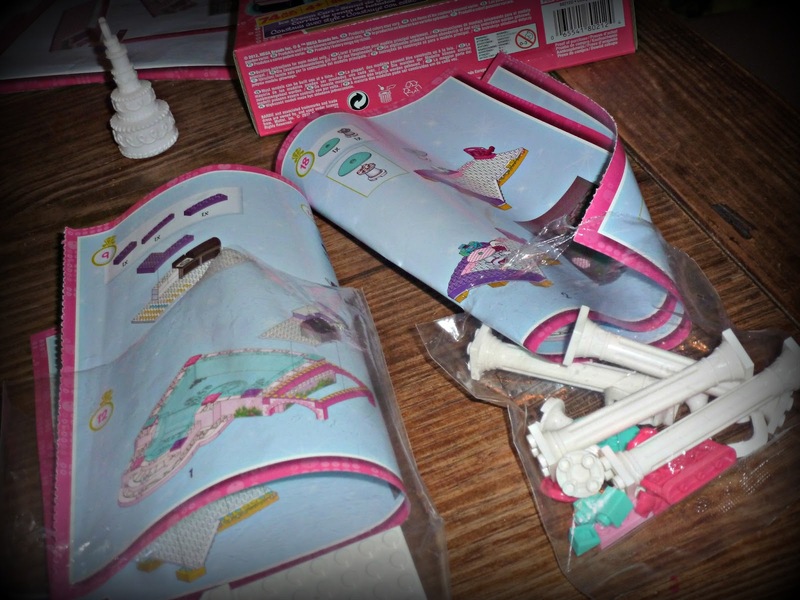 Many building sets with themes she would be interested in are geared to slightly older kids like 6-10 or 8-12, and even at those ages they've been a challenge for Katie's fine motor skill set. Mega Bloks Barbie toys are suggested for 5-8 year old girls. I went online right away to try to get an idea of how it was geared to a younger set and noticed that in the mansion, the block pieces seemed to be more accessories than actual building pieces. Since Katie has to-date passed on her building toys to spend ENDLESS hours playing with Polly Pocket, Pet Shop, and Squinky toys, I knew these would be perfect for her: lots of ability to play creatively, but beginning to incorporate the building, following instructions, and fine motor skills that I wanted to challenge her with. As the date of our party approached, the evil ugly flu reared it's head and our invited party guests dropped like flies, but we had a great group come out and tons of fun. 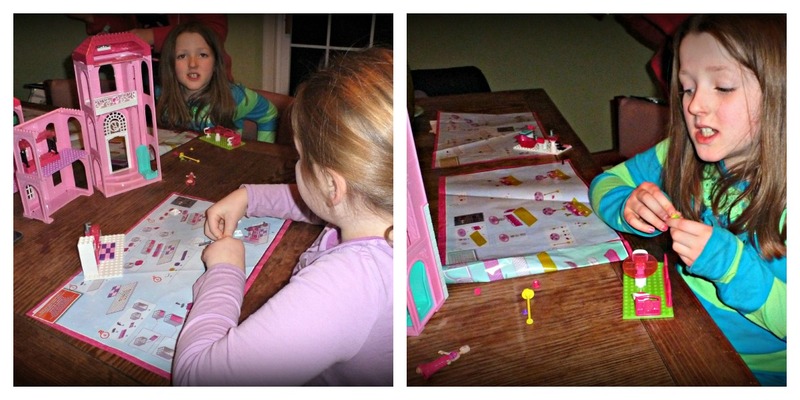 As soon as Maddie and Mackenzie arrived, the girls ran over to the toys to start planning. 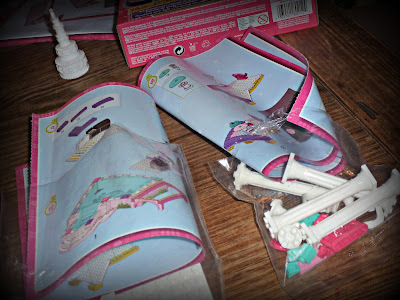 After I had opened all of the boxes and inner bags, we quickly realized that while there are TONS of awesome accessories for playing - there were also a lot of pieces to build. 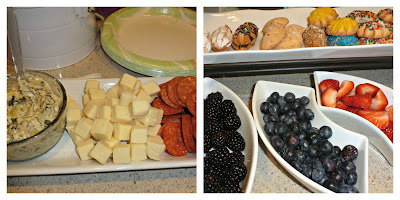 So, we started with our snacks and dinner so that we could clear out the kitchen for some serious building time. I was fortunate to have a few of my most clever and crafty friends with me and while the girls were eating we decided to sort all of the mansion pieces. Each room of the mansion has its own set of instructions complete with number of each piece needed and which stickers to attach. 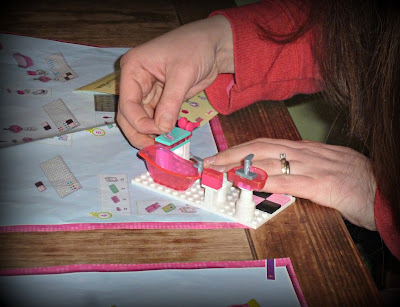 We ripped the instruction manual pages apart and created building baggies for each room of the mansion that included the instructions and just the pieces needed for that room. The girls got busy and did a great job. It was their first time following such detailed instructions and even our 7 and 8 yo needed a lot of adult help, but the fact that they could do some of it by themselves made them really proud. They were definitely eager to learn and understand what they needed to do. Katie got easily frustrated a few times. Our almost 5yo gave up very quickly and went to play with the boys. The moms stepped in to help apply stickers, keep the girls on task, and help attach difficult pieces (or more commonly unattach pieces that were put in the wrong place and then were too hard for the girls to unattach). I also helped to finish customizing the outside of the mansion, with windows, trim, and flower boxes. Once we got our system down, we finished pretty quickly with only two girls actively participating. By then, they were ready for a break. After a bit of energy release, our friend Olivia joined us to help build Barbie's dream pool. And really, this pool is built to amaze. I really like the sets because they leave you with something to actually play with once you're done building. There are tons of fun accessories including food, utensils, and pretty much anything Barbie could ever hope to have. The downside, there are so many fun things to play with and you have to be very careful so that the building pieces don't break apart. 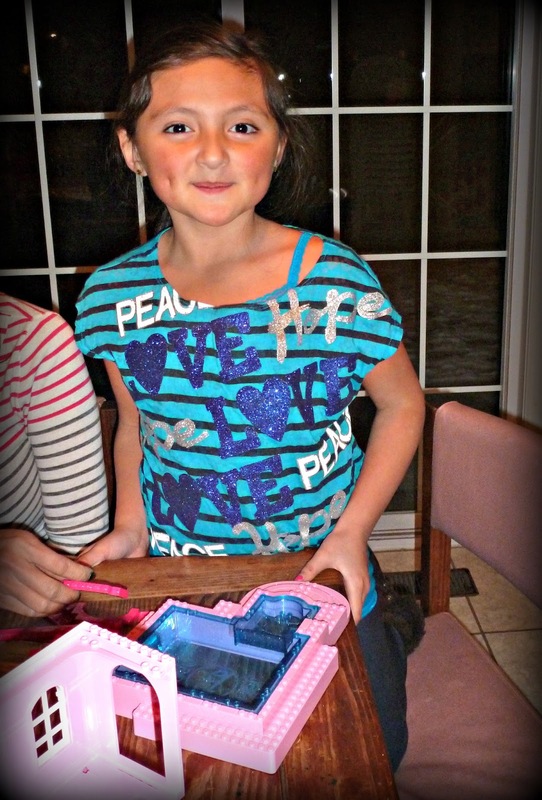 From our experience, I would caution parents that 5-8 year old girls will likely not be able to decipher the instructions completely on their own, but they can do it with help and they will have a blast playing with the completed project. Like Playdoh, this is higher on the parent involvement scale, but I definitely enjoyed our time building together. 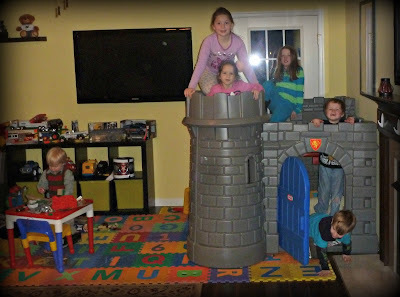 When tackling the mansion on your own (as opposed to having tons of hands to help at one time), it is set up perfectly to be completed as multi-day mini-projects, one room at a time. I received free products in exchange for hosting this party as apart of a promotional program with MomSelect. All opinions are my own. Looks like a great party. They Mega Bloks are such fun for the girls. Thanks for sharing.